Lena and I crossed the boarder early Saturday morning and went to the mafia run taxi outpost about 1 km from the crossing. As I mentioned in a previous post, Poipet, Cambodia is not the sort of place you want to spend a lot of time. Between the hoards of young Cambodian men hanging out on their motorbikes, eyeing your bags, offing suspect assistance, or just being sketchy, you start to feel like a walking ATM from the moment you cross the border. We intended to just split the $46 cost of the 2 hour taxi to Siem Reap, but at the station we met a couple from the Philippines who were also going to Siem Reap. Sweet, 46 divided by 4 is even cheaper. The ride from Poipet is actually quite enjoyable. Rice fields, and plains can be seen for the duration of the 2 hour drive from the border to Siem Reap. And on more than one occasion we spotted some sights that were not familiar to our western eyes. There was the father who had his young son between him and the steering column of his scooter, 4 chickens dangling from ropes on each side of the handle bars, a live pig, um, “hog tied” and perched on the back of the scooter, and he managed all of this effortlessly. My initial impression after the awe of the situation was to wonder how he managed to get moving. I’ve riding a few scooter recently and maintaining balance is not problem once you are in motion, but how did this guy go from zero km/h to anything other than horizontal on the pavement? Speaking of sights, it is not uncommon to see a pick up truck that is in “top load” mode. Imagine a pickup truck. Now fill the bed part with various bits of cargo. Now add about 15 Cambodian workers. Tricky right? Now put another 8 or so people on top of the cabin of the pick up truck, directly above where the driver and 2 or 3 other passengers are comfortably positioned. 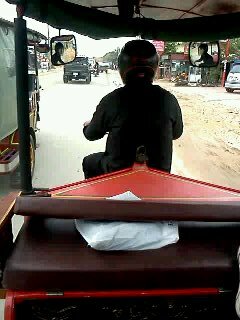 Finally, put all of this in motion at a reasonably fast 80 km/h and you have a Cambodian top load pickup. One side note: we crossed the border in the morning after a full nights sleep. So we were well rested and ready for the journey ahead. Yet, 20 minutes into the trek, Lena and the two Filipino friends we made at the taxi depot were fast asleep. I was also feeling quite drowsy and wanted to go to sleep as well, but managed to stay awake. Part of it was fear that the taxi had been gassed so that we would pass out and not notice our bags being searched for loot, and part of my alertness was based on the two syrupy Redbull energy drinks I had just after crossing the border. I can’t say for certain that the taxi had been gassed, but I have heard tales of traveler being drugged and robbed on night busses and the like. FYI. 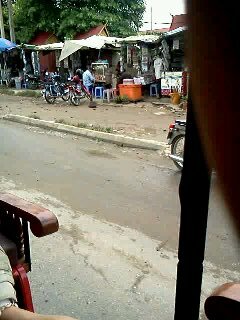 After about 2 hours on the road, we arrived at the outskirts of a flooded Siem Reap. 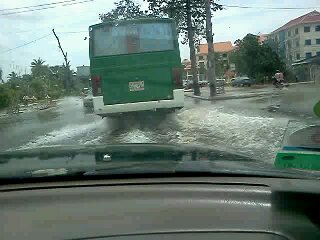 The flood waters were in the streets and there was a noticeable stream of water being jettisoned from the sides of the taxi. 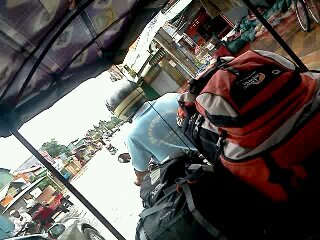 As expected, our taxi driver dumped us out at the edge of town into the waiting seats of a couple of tuk tuk drivers. The drivers offer you a free ride to your hotel in hopes that you will hire them to tour you around Angkor. Actually, they rarely take you to your hotel unless you have pre-booked accommodations. If you just have an idea of where you would like to stay, they will insist that it is too far or not in a good area, or whatever you will believe. They get a small kickback by taking you to an accommodation, hotel or hostel, with which they have an arrangement. 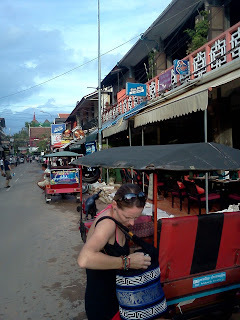 While this is somewhat shady, the hostels in Siem Reap are more like hotels and are usually of a very decent quality. 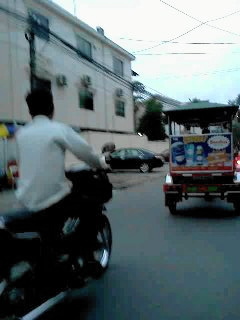 Plus, when you are paying $7 USD a night, the kickback the tuk tuk driver is getting can’t be that big. Lena and I were driven by Ramone, who we hired because of his English ability and affable manner. He showed us 2 hostels, and we settled on the first one, The Siem Reap Central Hostel, $7 a night. To say that we were pleasantly surprised with the quality would be an understatement. I’ll tell you more in part II. Tuk tuk ride in flood waters. Give Ramone a tip for driving in this. Below you get a glimpse of the Old Towne section of Siem Reap. 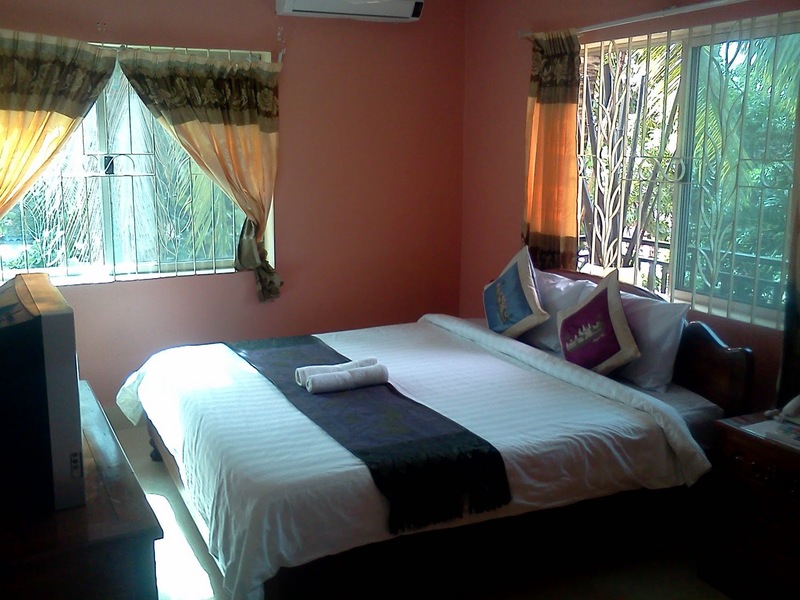 The picture below is from The Siem Reap Central Hostel. Like I said, more like a hotel.